Vicky: Fabiana, I first connected to you online a few months ago on Facebook, and have been following you and your lovely class ever since! Fabiana: Yes, you’re right, Vicky! I feel honored you have been following me! Vicky: The honour is all mine, Fabiana! I learn so much from you. My first question is, how did you become an educator? Fabiana: Well, when I was in High School I wanted to be a History teacher and a lawyer. Later, I realized I had to study something connected with the foreign language I was studying so, I thought of the possibility of becoming an EFL teacher. Vicky: Wow, a lawyer – me too! Thankfully, for the world of ELT, you became a teacher : ) Can you tell us a few things about your students? What ages they are, what sort of projects you engage in with them? Fabiana: I have always taught teenagers. I used to teach children and adults too, but my schedule is tight for I am a full-time mom. Right now, I am only teaching 13-14 and 17-18. Projects? Well, I had done crazy, but creative things in the past, that is to say late 80s when I started teaching, such as make my students read and record a whole play called “Murder At Walton, Hall” on video (VHS) where they performed like real actors and actresses! They had to study the script, adapt it or abridge it and simply… act! It certainly was a lot of fun for them, for the class and very rewarding and satisfying for all of us! Those that would not want to make a video, they made a picture story book with real photographs: they would dress up, take pictures and publish the “book” with narration and dialogs as in comic magazines. Some other projects were a little more complex and tough:my advanced students made documentary videos on the life of relevant people in the world: Mandela, Martin Luther King, Mother Theresa or Ghandi. They studied the biographies by heart, sat in front of a camera and started talking. Nowadays, everything is more digital: with my advanced Senior group I started commenting the news by reading Twitter, BBC World, CNN, NY Times, The Salisbury Post, Charlotte Observer and Buenos Aires Herald. There is something I truly value and it is the student’s self motivation and I try to promote and never let it die. The students you see in the photo below, traveled to Washington, DC and New York to attend the Global Young Leaders’ Youth Conference. They interacted with youngsters from all around the Globe and when they came back home they shared their amazing experiences with all of us. One afternoon, one of the boys got a voice message from a friend from Saudi Arabia telling all his international friends about the conflict in Syria. It was wonderful to listen to the girl and after that, discuss the topic all together. Last year, we worked on two projects: Alcohol Awareness-Underage Drinking and Cyberbullying-Bullying-Digital Citizenship which was a real success, as my students participated actively in video, audio and images: in class and at home. A lot of reflection and comments in a foreign language was not an easy task, but they were fantastic. My pre-Intermediate group participated in a project called “We Are On The Air”, which is an idea of a fabulous, Facebook friend and colleague an EFL teacher from Greece called Theodora Papapanagiotou. The students made videos about the area where they live and what they do. The idea is to show a bit of our city, Buenos Aires as well as some others around the world which she will include in her lecture at TESOL Greece this current year. Theodora and Fabiana’s project We Are on the Air! I believe English Language Learners need to speak the language at all times that is why I devote some part of my class to talk about updated news, like reading the newspaper in English, commenting on anything they read which they find interesting and doing vocabulary research. Last year, I also started a sort of flipping class using Edmodo, where I post varied types of tasks for them to do at home to be commented in class: Monday Morning News Update was We usually talk about the news the first minutes of the class: I feel my students need to be exposed to real content and have as much speaking practice as possible. Reading and listening make you a better writer and speaker. It is some extra work for me and for the students, but in the long run we both benefit from it, especially THEM who are the ones that matter. Vicky: I absolutely love what you are doing and have done with the kids, fabiana – it is all about discussing values and life as well, not only teaching the language and you do that very well. You also use culture a lot in your classes. Can you tell us how you do that? Fabiana: Buenos Aires is a melting pot, so maybe because of that, I have always been multicultural, and have never feared to learn from some other cultures. I taught in the United States for six years as an international and cultural exchange teacher so I would say, that was the key point in my career as a teacher. It opened my mind more than it had been before, and made me see things from different points of view. I interacted with people from all the continents and cultures which certainly gave me a lot of experience. I participated in fairs where we showed typical objects, traditions, music, videos, pictures, magazines from Argentina. We even took virtual trips to my country Since I came back to Argentina, I have worked at the same small private school, Colegio Canadá or Canada School, where its owners and administrators have always had a plan in mind: to be part of international projects: sports tours and exchange trips to English speaking countries, teach English as a foreign language intensively, make students sit for International Examinations, sing the Canadian Anthem or become acquainted with the History and Geography of English Speaking Countries. We do a lot of cross-cultural activities, I mean, if the Social Studies teacher is teaching The Tudors, we read about them in English, make posters to decorate the classroom, crossword puzzles, trivia and other activities online. Canada Day with Fabiana and her students! Vicky: You engage a lot in social media. How did you become involved in them, and how do you think they help educators? Fabiana: Honestly, I was really reluctant to expose myself online. About two years ago one of my best friends and colleagues and my friends in the USA convinced me to open an account on Facebook for me to be connected with other educators and keep in touch with them, respectively. Then, I became a sort of addict, browsed every education group and started to relate with the greatest teachers, educators, teacher trainers, and authors around the world. I began to build my PLN which has grown quite a lot and helped me to be a real connected teacher. Some time later, I even opened an account on Twitter. Sometimes I stay up really late as there is too much information to absorb in a such a short day of only twenty four hours!. Besides, being online gave me the opportunity to work hard on my CPD because I began to study a Specialization on ICT and Education and attend many free webinars provided by the British Council, Oxford, Cambridge, Macmillan, WizIQ, American TESOL, EVO Sessions, BESIG, IATEFL and some others such as the amazing Tics en El Aula. I even presented at two International Conferences: The Reform Symposium and at the Global Education Conference. It is a wonderful way to blend being a passionate mother and teacher! Vicky: You are so active and amazing how you combine everything! You also blog. Can you let us know what inspires you and what you write about? Fabiana: Well, I started blogging a little because in all my twenty something years of teaching experience, I have never documented anything I did! Nobody told me…! Last year, Shelly Sanchez Terrell invited me to join the 30 Goals Challenge Group on Facebook, and that was when I sort of pushed myself to write about my life as an educator. I know I am not perfect at what I do, but I try! I still have a long way to go, but still very happy I have already achieved some goals in my career. It takes time to think clearly what to write and how to write it: I am not a good writer, I´m just spontaneous and informal. Anyway, all I express is from the heart. Vicky: How would you like to close our interview? Fabiana: I am extremely thankful and proud to connect with you and learn from and with you. As I said before, I still have to polish some aspects of my English, my teaching and blogging among other things because English is not my first language, but I am really willing to learn and progress on a daily basis and I would like to inspire colleagues and students to feel the way I feel as a lifetime learner. Vicky: Fabiana, this has been such a great interview!!! Thank you and the kids ever so much for sharing and letting us into your classroom! 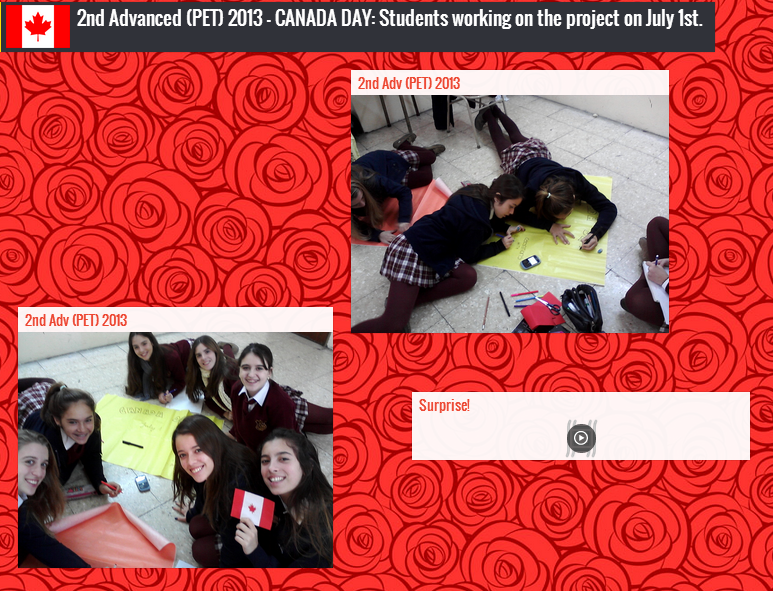 Posted on January 11, 2014 December 16, 2014 by Vicky LorasPosted in discussion groups, diversity, education, ELT in Argentina, interviews, learning, life, special moments, teaching, teenagers, young adultsTagged 30 Goals Challenge, blogging, Canadian Education, education, Fabiana Casella, learning, lesson plans, multiculturalism, professional development, Shelly Terrell, special moments, students, teaching, technology, Theodora Papapanagiotou. Wow! What an inspiring interview! Thank you so much, Vicky and Fabiana! BTW What is Fabiana’s blog address? Thanks Vicky for sharing this interview with awesome Fabiana. “Teaching English is beyond teaching the language rules” We learn things in English. Lovely interview. Another teacher that Shelly Terrel’s 30 goals challenge got blogging! A good thing too! Thank you Vicky for posting this interview. Even though Fabiana is one of my Facebook friends, I had no idea how much she has accomplished so far.It’s simply amazing. What an inspiring teacher! You both are. I hope I’ll learn more from you two in years to come. Thanks again from the heart! The honour is all mine, dear Fabiana! I am honoured to be connected with you and have your interview on my blog. I will also add the link to your wonderful blog! I really enjoyed this interview. Fabiana’s lessons are so creative, and she clearly brings a lot of enthusiasm to the classroom. Great. Very fruitful interview. Congratulations to you both.